If there's one thing that Fire Emblem Heroes proved without a shadow of a doubt, it's that the mechanics of a tactics JRPG can be tailored for mobile quite nicely. Langrisser has, over the years, been Fire Emblem's closest rival, and Langrisser's development team apparently noticed the success of Heroes because here we are, now with a mobile Langrisser. It must be said right from the outset that the Langrisser Mobile seems to be a much more ambitious project than Fire Emblem Heroes was. That game was designed to distill down the Fire Emblem format to tiny skirmishes that take place on a single screen. Langrisser, by contrast, has larger maps, and larger numbers of characters on each side in a battle. As a result, it feels much more like a complete tactics game, right from the outset. It's also gorgeous. Character design is nicely detailed and varied, and environments have a clean, bright, and appealing design to them. 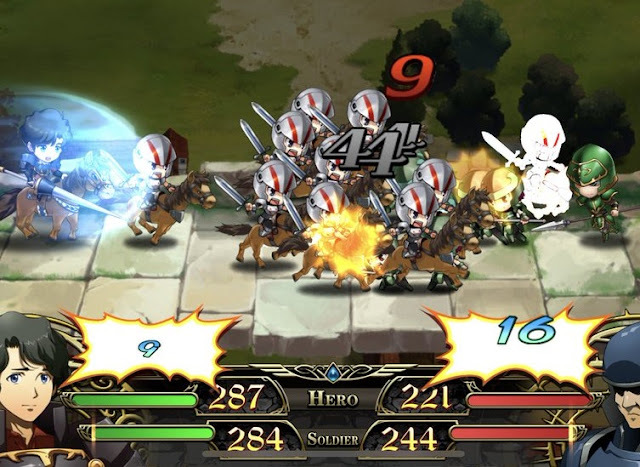 Anyone who played the Langrisser on the Nintendo 3DS will know that production values hasn't traditionally been this franchises' strength, but on mobile, the game is very competitive. I will say, however, that the writers need to get new translators and editors. Langrisser is still very much in preview mode (and indeed a public beta for the game doesn't even start for another week), but a lot of the good work that went into the aesthetics and character design is currently being undone by a dismal localisation that makes conversations sound stilted at best, incomprehensible at worst. Characters aren't consistent in tone, so I don't really get a sense of character from any of them, and it's difficult to care about the overarching narrative when there isn't a believable tone to the setting. But, again, I must emphasise that the game is still early in development, and the text may well be placeholder. And perhaps the narrative picks up after a few chapters anyway, so I can overlook any localisation flaws. I may well end up with characters that I truly love purely on design, too. It's very early days yet. As a mobile JRPG, everything that you would expect in one of these games is present in Langrisser. There is gatcha mechanics, which unlock everything from new characters to new equipment to give to them. That equipment needs to be forged over and over again, absorbing unwanted pieces of equipment in order to "level up" the equipment that characters are holding in battle. There is a stamina bar, and a few different currencies to juggle. Some are premium, some are earned purely in-game. If you've played Japanese mobile games in the past, then everything Langrisser offers will be familiar to you. The genre continues to come across as overwhelming to new players, however, and it'll take a while to get used to the cluttered main menu interface, and all the options available to you there. It's too early for me to tell if I'm going to hit walls that stop the forward momentum of the game entirely unless I'm willing to shell out for cash. I assume that there will be something in there to encourage me to continue investing real money, but then I've never really minded doing that either. Lord knows Fire Emblem Heroes got enough out of me while I was playing that. I would have put about as much money into that one's premium currency as I would have spent on a new game on console, for example. Assuming Langrisser holds my attention, I'll be happy to do that here as well. Langrisser's strength is its battles. There's a nice blend of heroes to choose between, each with their own strengths and weaknesses, and units all have special abilities and the like to further the strategic options. Furthermore, whenever units clash in battle, you get treated to a little cut scene of the two sides duking it out, and the quality of the unit designs really resonates there; it's adorable. I'm cautiously optimistic that Langrisser is one that I'll be playing for quite some time into the future. With more complex battle maps than what was offered in Fire Emblem Heroes, this game feels more like a genuine tactics RPG, despite the free-to-play trappings around it. It's still very early days for me, but aside from that awful localisation text, my first impressions are very strong!